I recently wrote an article about blockchain and since then I was interested to read a Black Book report showing that interest in blockchain is growing exponentially in healthcare. In fact, 88 percent of payers are considering implementing blockchain according to the report and seventy percent of all payers expect blockchain to be integrated into their systems by 2019. Acceptance on the provider side is moving slower. 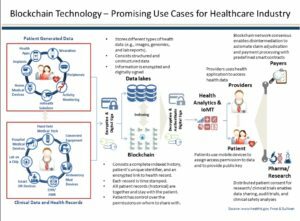 Providers realize that blockchain has great potential to solve issues they are facing (interoperability, connectivity, privacy and patient record sharing), but most are waiting to see how federal regulations unfold before implementing. Only 9 percent of healthcare providers and systems have firm plans for blockchain implementation by 2018. Provider leaders say this is due to the “undetermined costs” of blockchain implementation. Also, only 29 percent of hospital leaders have a “working understanding” of blockchain, whereas 82 percent insurance execs do. Holding the technology back is a lack of technical standards and blockchain is still immature, which is causing some regulatory uncertainty. The healthcare sector expects some federal rules will come in 2018 and the Office of National Coordinator for Health Information Technology is also considering it. Earlier this year, ONC requested white papers on its uses and received back over 70 solutions. As a result, it is believed that blockchain potential in healthcare is substantial. Black Book also ranked the top vendors in the space by respondent’s feedback based on their impressions of offerings to date. Here are the highest ranking blockchain vendors: Blockchain Health, Bloq, Burst IQ, Gem Health, Guardtime, Hashed Health, HealthCombix, IBM Blockchain, Pokitdok, Tierion and YouBase. These vendors received positive services and product perception scores above nine on a scale of 1 to 10.